It is very much in the nature of the game, the transition from a player to a manager is something that has been witnessed quite often in the past and it is something that is really interesting for a football fan. From the old to the new, it's a fascinatingly new job that every player might shudder at initially but the challenge lies very much in how they take it on. Pep Guardiola, Zinedine Zidane, Luis Enrique and Antonio are glaring examples of successful managers who've had a capable transition from the role of a player to the manager. The English Premier League has never been shy of boasting legends and its rich football over the past has produced numerous legendary players who have called time on their careers as time stretched their gaming period and age launched them into the dusk of their careers. It was not long ago when a beaming Frank Lampard arrived at the mid-lands to face an ecstatic press conference, a conference where he was hailed as Derby County's new manager. For a Premier League legend such as him who's entered the golden books of Chelsea's history, English media had a familiar English face to get excited about and there was no denying that Frank was too.
" You can't take away the love you have for wanting to succeed" was one of the few quotes that stood out at Lampard's first press conference and he made it absolutely clear that he's worked under several managers, noted down distinct styles and he has a fair idea of how he will get his side to play football. So far into the managerial career, he's had a fantastic start with his biggest success probably coming in the Carabao Cup as he knocked his former manager Jose Mourinho and Manchester United out of the tournament. In the championship too, they've been in blistering form and they are just two points shy of the leaders Leeds United and are placed in the fifth position. 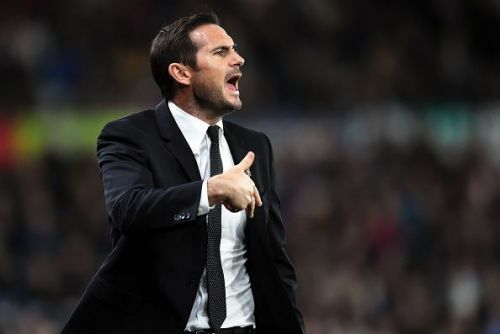 As for the tactics, Lampard plays a flamboyant 4-3-2-1 or a 4-3-3 with his side having a good work ethic as they try to play quality attacking football whenever they've got the ball. Mason Mount along with a few other youngsters have stood out in his short regime. Derby is just a beginning for Lampard and there is no denying that he's one Premier League legend who will become an interesting manager as days go by.